Valentines day this year marked the beginning of my reading week, and a visit from Tom for the last weekend of Winterlude. Upon beginning a week of relaxing, eating, and reading, I decided to make cupcakes for my two valentines: my dad and my boyfriend. Not wanting to stick to classic vanilla or chocolate, I thought I would try something new. First I brought the almond milk to a low boil in a small pot, turned off the element, and steeped the tea bags for 10 minutes. While the tea bags were steeping I mixed together all the dry ingredients in a large bowl. Once the tea was done steeping I removed the tea bags and stirred in the apple cider vinegar, letting it sit for about 5 minutes. This makes an equivalent for buttermilk. I let the flaxmeal soak in 3 tbsp water for a few minutes, and meanwhile added the coconut oil and vanilla to the tea mixture. I added the flaxmeal to the wet ingredients then incorporated the wet into the dry mixture. I evenly distributed the batter into 12 lined and greased muffin cups. Because it was Valentine’s Day I used my heart-shaped muffin cups, given to me by my best friend, Charlotte. The batter baked for 20 minutes at 350 degree Fahrenheit. For the frosting, I whipped together all the ingredients until smooth and piped them in different designs on the completely cooled cupcakes. They tasted more like cinnamon bun cupcakes to me, and were delicious with coffee for breakfast one morning. Also, margarine keeps a soft texture and does not harden the way buttercream frosting does. 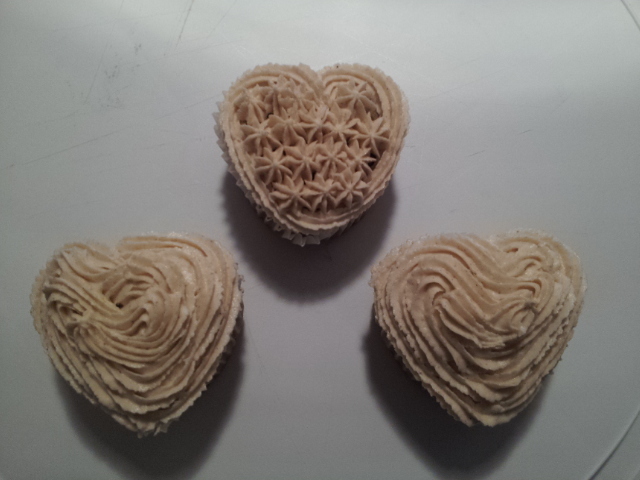 Overall I was happy with the way they turned out, and I will definitely be making more vegan cupcakes in the future. Ohh, I love this. I just posted a Chai recipe today and these look wonderful to go along side of it.